Festival No. 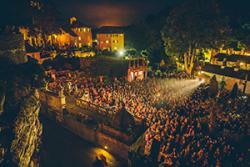 6 in Portmeirion's beautiful Italianate village setting: credit FANTASTICBangor University is excited to announce that academic staff and students from the Arts and Humanities will be hosting a range of events as part of this year’s special 6th anniversary of Festival No. 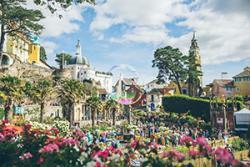 6 - a bespoke banquet of music, arts, culture and gastronomy which takes place over the weekend of the 7-10 September in the magical village of Portmeirion, Penrhyndeudraeth, home of the cult TV series The Prisoner. This year’s headliners at the Festival include Bloc Party, The Flaming Lips, and Mogwai, alongside special talks by Irvine Welsh and Maxine Peake. Six lecturers in English Literature and Creative Writing speak for six minutes each on a topic close to their hearts – anything and everything from medieval women’s humour, Victorian valentines, Dylan Thomas, Bob Dylan, seventeenth-century ghosts, and working-class fiction in the Brexit age. The audience will then get to vote on their favourite, who gets an extra six minutes on their chosen topic. Contributors include Lisa Blower, Michael Durrant, Karin Koehler, Sue Niebrzydowski, Steve Price, and Andy Webb. 6x6 offers a chance to hear six published writers and critics compete against each other for your vote by telling the most intriguing, outrageous, funny, and downright weird stories about their areas of expertise. No album is more colourful than Sgt. Pepper, and no song on it more so than ‘Being for the Benefit of Mr. Kite!’. John Lennon’s declared intention in writing this song (as he told Beatles producer George Martin) was ‘to get across all the effects of a really colourful circus’. Professor Chris Collins (Head of the School of Music at Bangor University) will show how ‘Mr. Kite’ can open a window into the minds of the Beatles in 1967 as they devised and produced their most seminal album. ‘Electroacoustic’ broadly refers to the unification of acoustic sound and electronic technology. Electroacoustic music is generally experimental in nature and spans a wide range of exciting musical subgenres. These workshops led by Alex Bailey (PhD student, School of Music) provide a fantastic opportunity for participants to record, manipulate, transform and mangle ordinary every-day sounds into weirdly wonderful and striking multi-channel quadrophonic soundscapes. In these Welsh medium workshops led by experienced writers from the School of Welsh at Bangor University, Professor Angharad Price and novelist Ruth Richards will suggest ways to start the process of writing fiction: developing technique and inspiring ideas, characters and dialogue. In this lively workshop Gruffudd Antur and Elis Dafydd (both PhD students in the School of Welsh) will introduce cynghanedd and Welsh strict-metre poetry in an entertaining and informal way which will be suitable for complete beginners as well as those who have more experience. Dr Zoe Skoulding (School of English Literature) is a poet whose main interests lie in sound and performance, ecopoetics and urban space, and translation as a creative practice. Discover utopian spaces created by writers around the world – and build one of your own during the Workshop: Imaginary architectures. Sharpen your senses with a series of group writing exercises around the space of the festival during the Walkshop: Collaborative poetry walk. Zoe will also be giving a poetry reading on the theme of imaginary architecture and/or the dream spaces of hotels. Learn Welsh North West is a local consortium between Bangor University and Grŵp Llandrillo Menai which employs highly trained staff and is responsible for delivering Welsh courses for adults in this part of north Wales. Bangor University has recently gone from strength to strength. It has always been an excellent research university, but has recently also won accolades for its teaching: it was the only university in Wales to receive ‘Gold’ in the UK government’s Teaching Excellence Framework 2017, and has consistently achieved excellent results in the National Student Survey in recent years. The University i invites festival-goers to meet staff and students from Bangor University in the exciting atmosphere of Festival No. 6, and help them celebrate their achievements in one of the best and most beautiful places in the UK.